V 2.33: New version of the flash tool from 06/2013, compatible to driver series 4.x. Firmwares unchanged. - HDSPe MADI update to V 31: Mute for channel 15/16 at 192 kHz in 56-channel mode. - Contains MADIface firmware V 19: Another update to the MADI receiver. - Update of the MADIface to V 16. A few cards had issues with the MADI receiver. - Update of HDSPe MADI to rev. 29. Since rev 218, when sending 32 bit audio, the U-bit in the output channel status got modulated. - Update of HDSPe MADI to rev. 28, HDSPe RayDAT to rev. 12, HDSPe AES to rev. 8 and HDSPe AIO to rev. 12. In combination with driver 3.24 the TCO function has been improved significantly. - Update of HDSPe AIO to V 11. AEB8-I/O did not work (ST7 and Internal ADAT Out). - Flash programming algorithm updated. 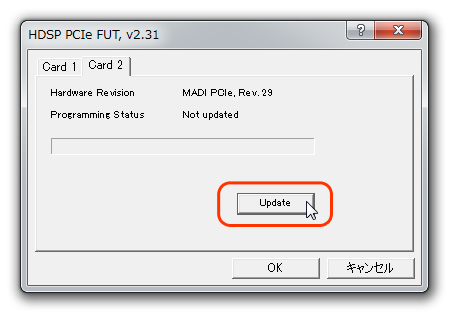 Update of the HDSPe PCI and ExpressCard to V 18 (changes for Mac HDSPe driver v2.69). - Update of the HDSPe RayDAT to V 10, AIO to V 10. AIO and RayDAT: in record output mode (internal loopback) the output data had not only been recorded, but also fed back into the mixer inputs. The record output function had been missing for all the AIO's analog I/Os, including the optional ones. - Update of the HDSPe MADI to V 25, AES to V 6, RayDAT to V 10: Fixes increased system load when extension board is not connected and MIDI is started. AES V 7: Improved AES receiver. - Update of HDSPe AIO to V 9. Channel order changed. - Update of MADIface to V 11. Internal timings had to be optimized for stable operation. - Update of HDSPe AIO to V 8. Internal word clock detection (LED) sometimes failed. - Update of HDSPe MADI to V 24. - MADIface and HDSPe MADI: MADI input buffer improved. In 96k Frame mode the card's now switch to 56 channel mode when the sample rate exceeds 48 kHz. - Update of the MADIface to V 9: Bugfix: Interrupt hangs after heavy MIDI + audio traffic. - Update of the HDSPe MADI to V 23: The word clock out signal was not in phase with the MADI out stream. - PCIe 2.0 compatibility improved by two changes in the communication to the chipsets. - Bug fixed in all HDSPe cards: switching off channels could lead to an invalid state within the hardware. Typical case is repeated start/stop of ASIO which then causes a BSOD. - Update of the RayDAT to V 6: ADAT/SPDIF Sync displays and input buffer improved. WCM no longer operates with inverted phase. WCM Lock LED is now functional. ADAT ports 1/2 and 3/4 swapped, now equalling the print on the PCB (updated manuals on the website). The internal inputs AEB/TEB have been changed to ADAT 1/2, because the outputs reside (fixed) on 1/2 as well. - Update of the HDSPe PCI to V 14. Adds support for the TCO. needs driver 3.068 or higher for Multiface and Digiface. - Update of the RayDAT to V 5. ADAT 3/4 and MIDI I/O 1/2 have been swapped. The input receivers mute when no signal is found. All rights reserved. Windows XP/Vista/7/8/10 are trademarks of Microsoft Corporation. RME is a trademark of RME Germany.